Gambier Island is host to many beaches, kayak launching areas, and hidden coves for swimming. There are paddling route, excellent hiking trails through the forest, and five major campsites on the perimeter of Gambier Island: West Bay, Halkett Bay, Brigade bay, Douglas Bay, and Ekins Point. There is also camping at Gambier Lake which is a 3-hour hike from Douglas Bay. Here are five different kayak routes to explore Gambier Island. Follow the Gibsons shoreline until you are past the Langdale ferry terminal. Exercise appropriate caution to avoid ferry and other commercial traffic. Once clear of this traffic, cross the channel toward Grace Island, just off the southern tip of Gambier Island. Slip behind the island around the point into West Bay. Paddling down the shoreline of the bay, you will pass towering rock cliffs and occasional beaches. Vistas worthy of picture postcards are a treat for the eye as the snow-capped mountains rise out of the water on every side. 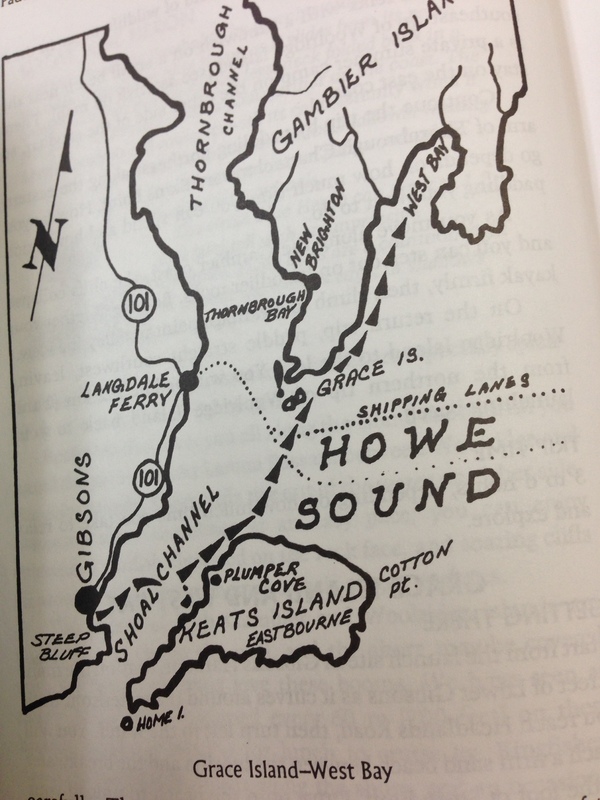 Map of Grace Island and West Bay. Going ashore you will find two public wharfs, Gambier Harbour and West Bay, each giving you access to the island. At the very end of West Bay is the mouth of a creek, where you can hear the water tumbling down the mountainside in the winter rainy season. You can go hiking through the woods which are all hung with moss. This is a possible campsite if you are planning to stay overnight. Moss and lichen are a beautiful feature of this shoreline. They grow in great profusion on the rocky cliffs, constantly moistened by the water that seeps down the steep slopes. Along with ferns, the moss and lichen form a study in green textures clinging precariously on narrow ledges of rock. Paddle across Shoal Channel and around the north side of Keats Island. The towering peaks of the Coast Mountains open out before you in a magnificent vista. Hugging the coast of Keats allows you to enjoy the various kinds of starfish that cling to the rocky shores. Wildlife spotting while kayaking near Gambier Island. Collingwood Channel is a favourite spot for viewing wildlife of all kinds due to the brisk tidal flows. Watch for many different species of birds, seals, and the occasional whale. From Cotton Point on the eastern tip of Keats Island, head across to Hutt Island where you can slip into the lee of the island for a rest before venturing across Collingwood Channel to Gambier. The shortest crossing to the island starts here, but head for a point east of Hope Point, on the southeast end of Gambier, to stay in the lee of Bowen Island. Hackett Bay is than a short paddle down the coastline. This provincial marine park has excellent campsites. From here you can explore the eastern face of Gambier Island and enjoy its wonderful seascapes. Tucked away inside a government wharf lies at the end of the bay where a thick fringe of hemlock and second-growth fir shield the shoreline from view. If you walk into the shade of the trees, you’ll discover a series of clearings linked by old logging trails that have assumed the character of sedate laneways. You could camp here where there are several formal sites or on a small island just offshore in the bay. The island boasts a small beach, above which stands a clearing large enough for one tent. You can hike the old logging road that terminates beside the campsites at Halkett Bay west to Camp Fircom, a half-hour walk. At first the road leads through the forest, but it descends to the shoreline as it nears the camp, with a pleasing view south of Hood Point on Bowen Island. From the launch point you are looking directly across Thornbrough Channel toward Gambier Island, with Woolridge Island directly in front and snuggled up against Gambier Island. Thornbrough Channel is a protected waterway and usually calm. Paddle toward the western tip of Woolridge Island. The coastal mountains are spectacular from the middle of the Channel. Rocky beaches greet you all along the island shore until you round the point to enter Latona Passage between Woolridge and Gambier islands. Through the still of the waters you will see Herons galore on the log booms, Kingfishers swooping between the shores, and trees and seals keeping a close on what we are doing. There is a small beach near the southeast tip of Woolridge Island where you stop, relax, and have lunch. Continue the trip by paddling northeast along the eastern arm of Thornbrough Channel toward Ekins Point. As you move along the Gambier Coast, the cliffs collapse and you can launch on friendlier rocks. At Ekins Point you will have spectacular views and there is a camping site available. On the return trip to Port Mellon, paddle straight southwest, leaving Woolridge Island to the left, and then another 3.2 km to your launching site. Launch from Gibsons Harbour or from Port Mellon to Douglas Bay and Brigade Bay. From Port Mellon paddle toward Woolridge Island, and continue to the east side of Gambier Island opposite Anvil Island. This side of Gambier Island is spectacular, with rock cliffs soaring out of the sea against a backdrop of towering Coast Mountain. This area is uninhabited except for the abundance of seabirds and seals that fish the channels in numbers. Camp on the shorelines of Ekins Point, Douglas Bay, or Brigade Bay under a canopy of gigantic maple trees and enjoy the peace and tranquility of the outdoors. Douglas Bay and Brigade Bay. You can visit the waterfall in Douglas Bay or do some hiking. If weather permits, enjoy a trip to Christie Islet and Pam Rock. This tiny islet and sprinkling of bare rocks, poking out of the water just south of Anvil Island, is home to one of our largest seal colonies. They are also the breeding grounds for Glaucous-winged Gulls and cormorants, Harlequin Ducks, Hooded Mergansers, Bonaparte’s Gulls, and many others can be seen in their seasons. The Double-crested Cormorants have been building their nests if twigs on these rocks for many years and now they are 2-4 foot high structures perched on the rocky ledges. A very unique sight to see. To circumnavigate Gambier Island, you can paddle in either direction depending on the conditions at the start of the trip. From Gibsons Landing Harbour around Gambier Island and back to Gibsons Landing Harbour it is approximately 41.5 km (26 mi). Expect to paddle about 5 km/h (3mph) if you are moving at a relaxed pace and stopping to enjoy the sights. Paddling time will also depend on the direction of the tide and wind. There are five major campsites on the perimeter of Gambier Island: West Bay, Halkett Bay, Brigade Bay, Douglas Bay, and Ekins Point. Take your time and enjoy the scenery. This was written by guest blogger, Sunshine Kayaking. This company was Established in 1991 and is conveniently located along the waterfront in Gibsons Landing Harbour. They offer kayak, canoe, and paddleboard rentals, tours, and lessons, along with to sailing tours and fishing charters.